When you have a new baby there’s so much to think about and buy. It can become overwhelming. It’s important to remember that you don’t have to buy everything your baby will need at once. You have time to shop. One of my favorite memories is Noah’s first Christmas. Of course, he won’t remember it, but it was an amazing day. You will feel this way about all your baby’s firsts. A great way to remember your baby’s first Christmas is with a Baby’s First Christmas Ornament. I know what you are thinking, Christmas isn’t for months, but trust me, shop now. You want the perfect ornament. It will become one of most important ornaments on the tree. When it’s placed on the tree, you will remember the excitement of their first Christmas. You will want it to be special. I still place my baby’s first Christmas ornament on the tree every year. Noah, does it now, but it’s still one of the crown jewels of the tree. If you are looking for a unique gift for a baby shower or a new baby, you could get a Baby’s First Christmas ornament. That way your gift will be used year after year. The family will always think of you at Christmas time. There’s no rule of how many Baby’s First Ornaments a child can have as each would have its own special meaning. For example, Noah has four! It would be a cool idea to give them something that the baby wouldn’t grow out of or decide they are too old for, like a toy. Noah is constantly trying to get me to sell his baby toys, but I won’t do it though. I am cheesy like that. 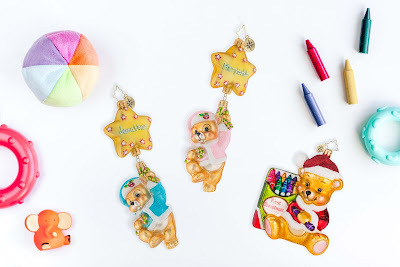 As you will remember, I partnered with Christopher Radko on another post and I wanted to share with you my two picks of Baby’s First Christmas Ornaments. Take note in case I have another baby in the future! My first pick is Color Me Cute. It has such a sweet bear with a box of crayons and I love that it can be personalized. Personalization is great for when you have kids who fight over which ornaments are theirs, just like my sister and I used to fight over Easter Baskets. They were exactly the same, so I don’t know why we fought over them. This ornament is bright and just makes me smile. I mean, who doesn’t love a bear dressed as Santa? It’s also a great size, so it definitely will be noticed on the tree. Of course, it’s Christopher Radko quality so you know it will be well made and will last for years to come! My second pick is First Things First. I like this one because you can specify if it’s a girl or boy ornament which makes it even more personalized. It can be personalized on the star with your child’s name and honestly, if you don’t have a baby’s first Christmas ornament, this would be a good one to get even if your child is older! 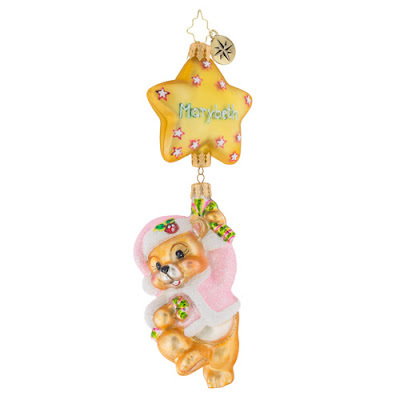 This is a very nice ornament with a bear dressed as Santa hanging from a star, and even if it doesn’t scream “First Christmas” to you, it would be great for a child’s ornament exchange.